Calling all investors to bring this beautiful piece of history back to life. Property being sold as-is. Buyer responsible for City of Joliet Code and/or Permit Violations. 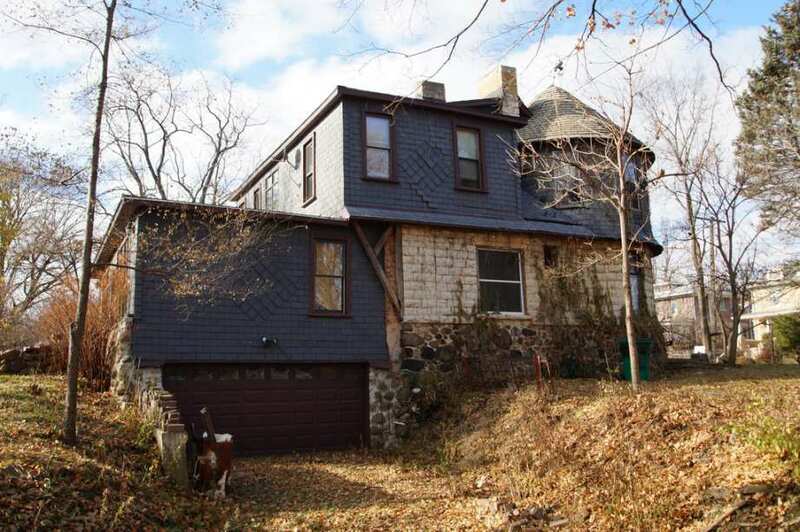 This unique property boasts over 3,200 square feet, sits on 3-1/2 lots, has a limestone exterior and a turret. 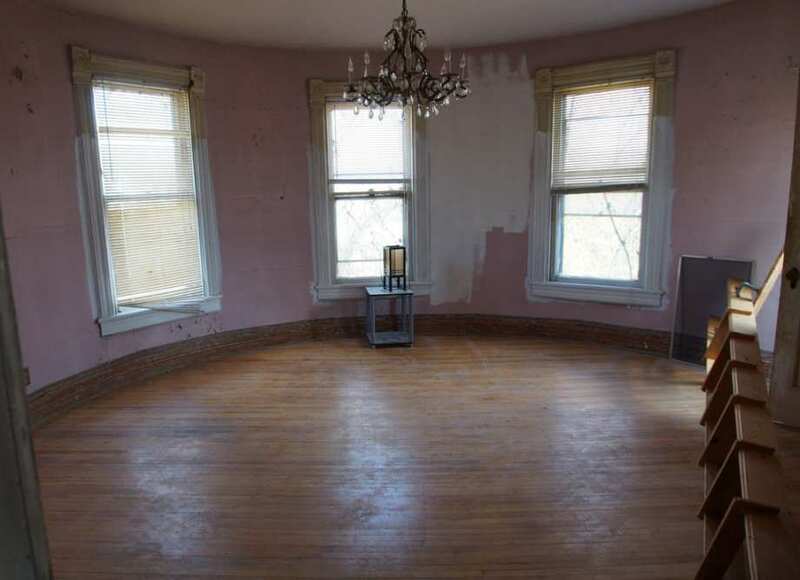 This diamond in the rough has original hardwood floors throughout and beautiful woodwork and is just waiting for the right buyer to restore it. 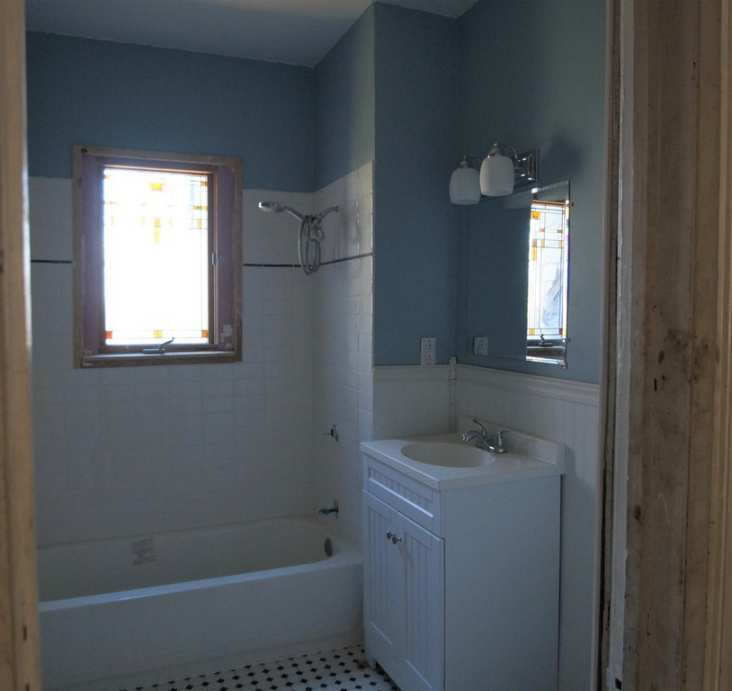 Updates include; bathrooms, kitchen, some electric and plumbing. 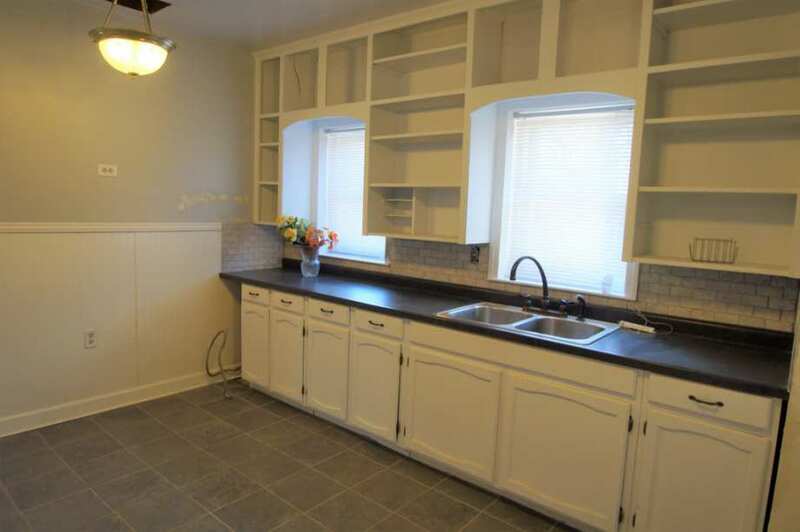 Renovation loan or cash only, will not qualify for conventional or FHA financing. No one day code. 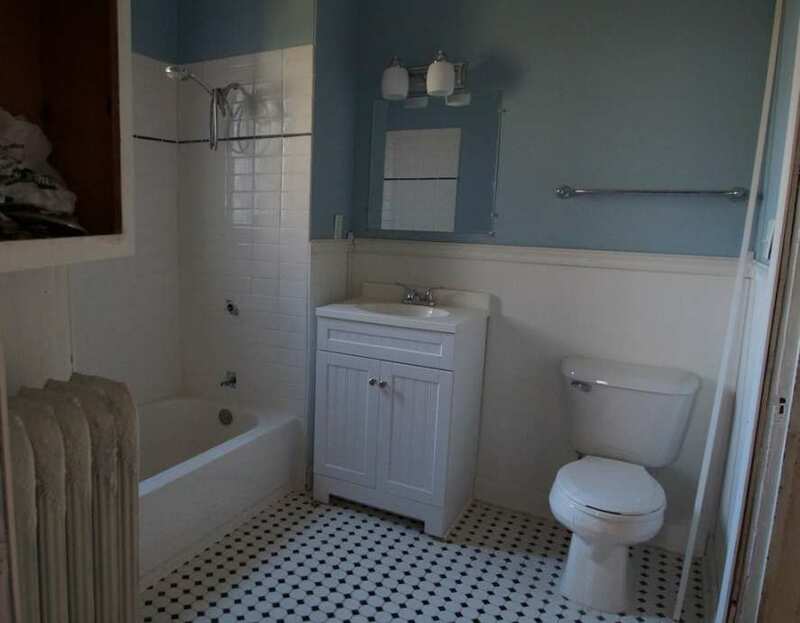 There are more photos on Redfin, actually looks like they were taken during different reno times so I’m not sure what’s the newest. Since this home has multiple news articles about it…one from 2017. Interesting article. Funnily enough, when I saw the 4th picture, my immediate thought was that it looked like the house should be considered haunted. Then I scrolled down and saw this article. Weird. At the time the article was written (4/2017), it claims there was already a potential buyer–does that mean they bought it, started doing some renovation, then left? Oh. Wow. That ceiling molding in the public room(s) on the first floor?? They haven’t invented a superlative yet that would do it justice. Such a lovely house! Romanesque Revival houses were almost always the grandest of all 19th century styles. 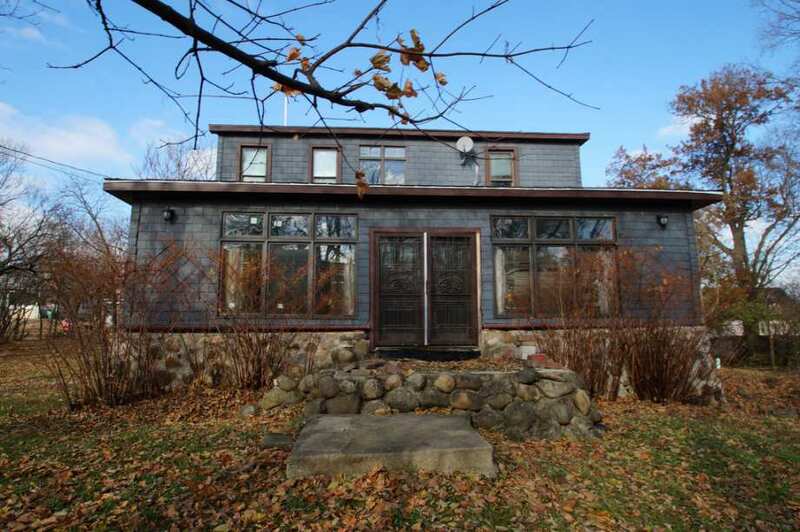 It’s interesting to see the style scaled down to a relatively modest cottage. I love the use of limestone blocks and the giant arched entrance. I personally know this house because Morgan Street backed up to the alley behind my house. I lived there for 14 years and I was the President of the St. Pat’s homeowners group. This house has a very interesting history. There was a write-up on it back in the Joliet Herald in the early 80’s and there is a video of it on Youtube. It could really be a charmer and nice to see so much of the original remains. The google street view is soooooo cool. I would buy this house just based on that! I’d love to be the one to restore this lovely lady. A storybook look to this wonderful house, interesting from every angle! 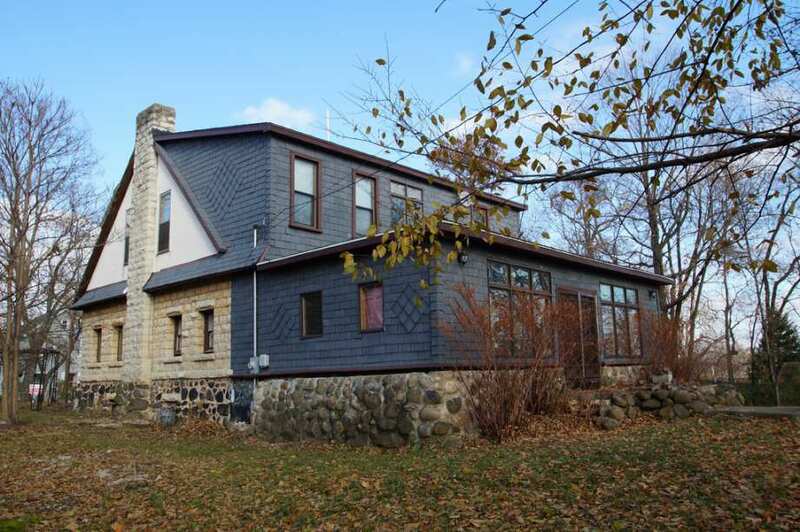 This is one cool house, nice size on nice lot(s) … what a great buy for someone! I wonder what the story is with all of the mantlepieces? Were they the saved originals or just? Very intriguing house! Sad to see such a formerly grand house fall on hard times. The exterior suggests it has experienced a steep decline over the years but at least some of the period details remain. 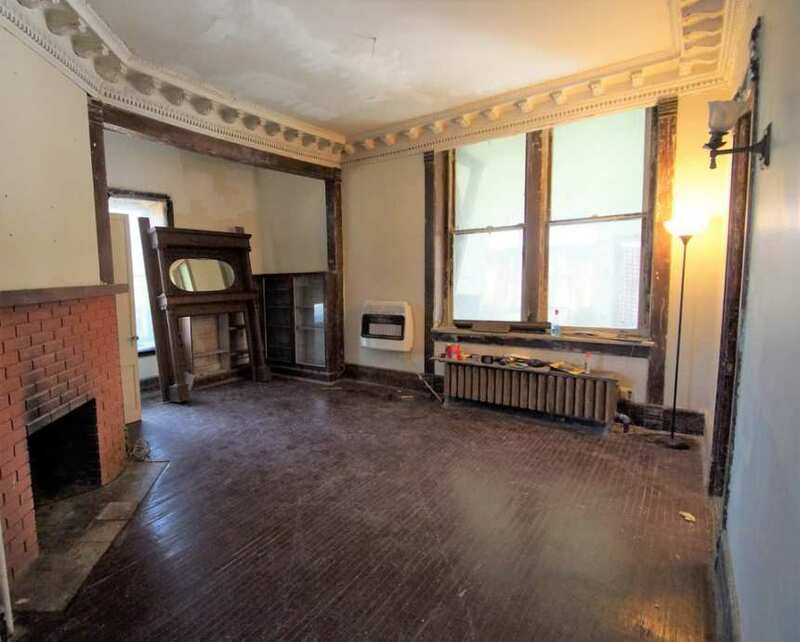 It may be a worthy candidate for a top to bottom restoration but if the surrounding neighborhood is sketchy, then probably not. I won’t even seek information about the taxes but from those properties I’ve looked at in Illinois they seem to run about $1,800 for every $25K of assessed tax value. Thus, for a house valued at around $100K that could run as much as $7,200 annually, divided into two equal payments paid every 6 months. Owner occupied homes have less assessed taxes than rentals. However, I’m not aware of any tax breaks for seniors. If the Land of Lincoln doesn’t find a way to reduce the tax burden on its citizens, the result will be continuing losses of people and its fine stock of old houses. The present tax structure was conceived during a time of prosperity when the heavily industrialized state had a healthy large middle class. Today’s post-industrial Illinois economy simply cannot sustain the current tax structure for the long term. Some painful choices lay ahead for taxing authorities or the unpleasant realities created by high taxes will only get worse in the years ahead. To the best of my knowledge tax breaks for seniors in Illinois are on a county by county basis. One county might have a decent reduction while another might not. One would have to check what Will county does about that. It’s an interesting house and if I could afford it and the neighgorhood was okay I’d certainly consider it. Thanks for the information. I have noticed differences in taxes depending on the location. I guess if I see a “must have” house in Illinois, best to check on the taxes first. It is $5,000 off accessed value for 65+ senior discount. The assessed value for this house is about $44,000. The taxes paid last year were $5,000. 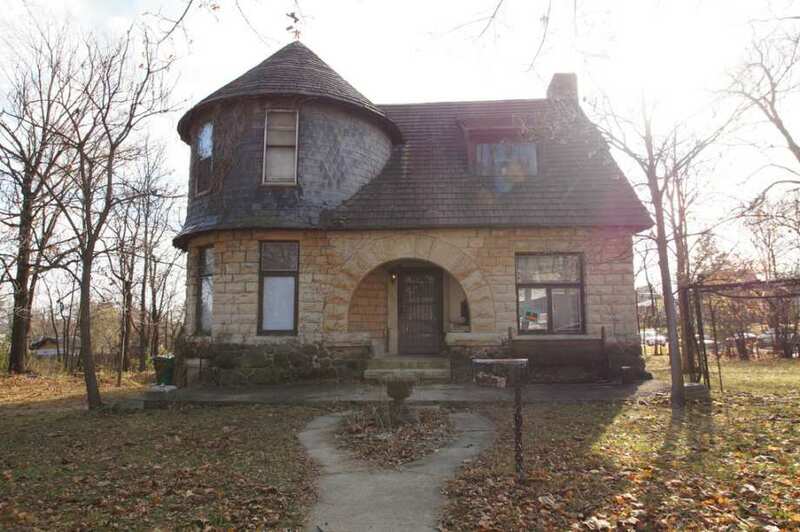 my little old farmhouse is assessed at $48,000…..my property & school taxes are $465 per year..frozen when i turned 65 ..
Taxes in that neighborhood are very reasonable compared to other newer neighborhoods. What’s wrong with this house? – Nothing, absolutely nothing. It has so many incredible touches both inside and out – too many to list but all that fancy exterior work on the siding and worth it just for that amazing entrance and then inside, the kitchen, the room with the amazing ceiling and all the other little quirks and touches – so worth it for the price and what’s been done hasn’t hurt it yet. Totally fascinated with this house. Some additional photos. Staircase doesn’t seem right in the house. One photo shows a door opening up OVER the stairs. It’s a substandard door size and my guess is it’s linen closet, not a door into a room. The placement would make it easy to reach in and grab sheets and towels to bring downstairs. I think those stairs lead to the basement and were added after the house was constructed. A lot of older homes did not have interior access to their basements. I have been in several homes that had interior basement stairs added post construction. In this house, this may have been the only area where stairs could be added and the benefit of having the stairs outweighed the utility of the closet. No from what I’ve seen, most homes built during the later half of the 19th century almost always had interior basement steps. At least 1870s on I can say almost all catalog homes or architecture plan books I Gabe are set up that way. Usually in the kitchen near the back stairs. If it had them. If not under the main flight. Unless the house is not built by an architect and a local in which you get some goofy or old fashioned customs. This house has been so butchered it’s hard to tell some of these odd things without being there. I’m almost tempted to drive there. Disagree. Many houses were built without interior basement stairs for several reasons. Basements were unfinished, musty, damp, and usually dirty (from dirt floors and/or coal for heating, etc. ).The decision to build without an interior basement staircase has nothing to do with whether or not a house was built by an architect. There are many old house design plans that have interior basement stairs, but there are also many that do not. Ultimately, including basement stairs would be up to the builder who would base their decision on the circumstances of a particular house. My house is a vernacular second empire farmhouse and it has never had interior basement stairs, but it has always had exterior access to the basement (much like this house does). If this house did originally have a staircase to the basement, this is not it. Virtually no house of this era would have an open stairwell to the basement. In fact, most new houses do not even have open stairwells to the basement. Furthermore, the odd placement of the door near the top of the stairs is a clear indication that these stairs were added later. Maybe I misunderstood you. I am only referring to CLOSED staircases. Not open. My experience is with mostly city houses. Maybe some farm land homes were dirtier. But still most homes I have been to usually have a convenient stair in the kitchen. Kitchen which too were closed off from the house because of odors. I lived in two old houses in northern Illinois (1870 and 1905) and visited many more; I never saw a basement staircase that wasn’t in the interior. The same is true of the houses I lived in in Minnesota (1905, 1900, and 1930 and visited others). However, the two houses (1910 and 1909) I lived in in Portland, Oregon, both had no access to the basement from the inside (at least originally), and I knew of many other like that. Often there was later built an addition on the back of the house to allow access to the basement without going outside. My 1909 house had had the back porch enclosed and enlarged to do that. The 1910 house’s basement was only accessed from the outside. I thought it was odd, but it wasn’t uncommon there. Hi Karen. Great response. Makes me wonder if the homes with exterior access were not built by architects and more by the village builder. Or An older person who requested was still not trusting of the basements. Or regional ? But interestingly the majority of floor plans of the time all have interior steps to the cellar and its even in the cheapest houses. Especially catalog homes. I have collected thousands of interior plans from the leopard. Some only had part of the basement cemented for laundry or stores but it’s usually under the kitchen. In my travels around the United States and visiting all sorts of homes haven’t encountered this except for in few circumstances. One thing I hate is conjecture or people making assumption based on old wives tales. People often misunderstand the late 19th century and confuse and equate this period to the colonial times. And though there were many homes in the village and city that didn’t have the money for modern conveniences like the middle class, it certainly was the beginning of the modern life we live today. Which can’t be forgotten. Your comment makes some sense. The 1909 house I lived in was originally a streetcar worker’s house. 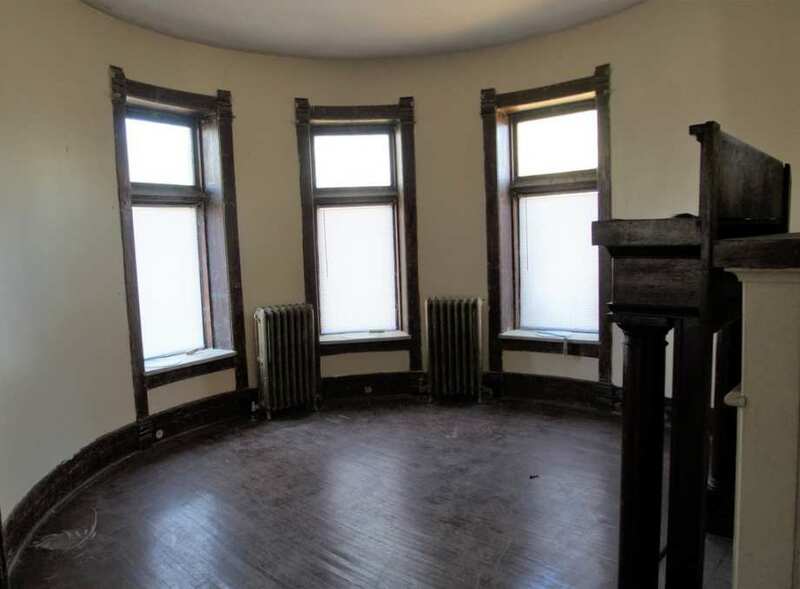 The 1910 one was an upstairs and downstairs duplex (built like that), but both tenants had to go outside (there was an outside back stairway) to get to the basement. The second floor unit was reached by a staircase in a small foyer. I was also in similar houses in Portland (cottages and bungalows) in which the basement stairs were inside. I suspect that most homes built for the middle and upper classes in Portland did have interior basement stairs. I’m not sure why so many didn’t unless it was to save space inside as the ones I knew of were very small houses. This conversation got me doing some extensive research through books and archive.org. The term Basement and Cellar are used interchangeably. And sometimes I noticed people calling a sub basement the cellar with furnace and coal, and the other with kitchen and laundry the basement. Like in town houses. Also in my searches these last few days were some reports about improperly built houses. One talks about design where the domestic servant needs to cross the dining room and go under the main stairs to access the basement or go outside to the back of the house. This was considered a defect putting the basement stairs under the main stairs instead of the kitchen. I also noticed some homes on the west coast have crawl spaces in the design plans and no official basement. Which makes sense why you’d have no access inside. I’ve not been to Portland Oregon nor do I have a lot of information on that area. I do know I love the pictures of the Victorians there. That makes sense. Thanks for the research, MJG. I can’t swear that the basements of the houses in question were originally full basements or not. 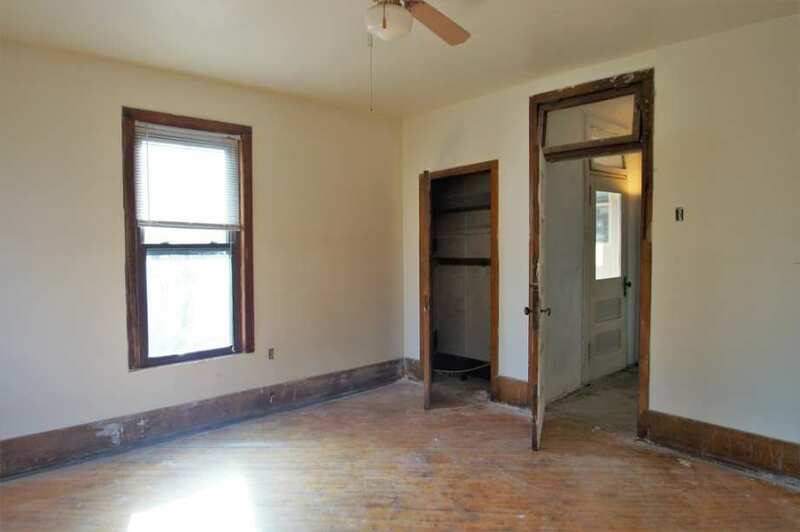 I’m pretty sure the duplex was, but the 1909 cottage possibly did not have a full basement. At some point the front and back porches had been enclosed, and a garage was dug in the front part of the basement. The sills in that house had been replaced, so who knows? Interestingly, two neighboring houses, approximately the same size and also built for streetcar workers did have original interior basement stairs, both going down from the kitchen. I was in a house once in Wisconsin that had a basement stair, but the “basement” was really only a small cold storage room about ten by ten. Funny how that worked out. I can’t imagine a basement only under a small portion of a house. But I have seen it before. So what you are saying sounds right. Some floor plans read just that; cellar under kitchen. Or laundry room finished in basement with cold room storage and the rest of basement unexcavated. A surprising number of old house owners don’t know what the double or triple sinks in the basement were even used for. Most think they’re just utility sinks for cleaning paint brushes or potting. When I tell them they are laundry bins and snow them photos they are shocked. I guess everyone thinks of the wringer washer and thinks that was it. The wringer attaches between each sink. Ring the clothes into the next sink bin for rinse. It took me forever and a day to finally access the article and photos but I agree with you that the upstairs door opening up into the stairwell makes no sense. 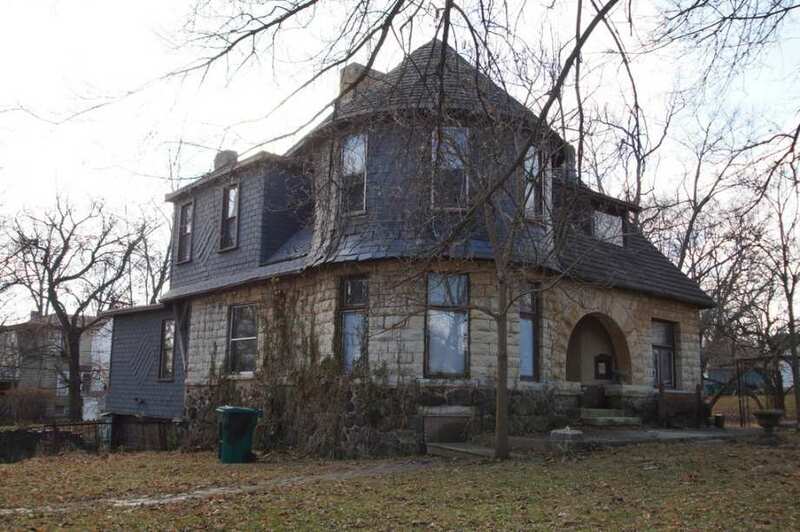 Because it was designed by a prominent Joliet architect, maybe some floor plans or interior photos exist somewhere. It would take a lot of work to determine the exact original configuration. The turn of the last century mantels seen are not original for an 1880’s house. (they are newer) Still, this is a rare Romanesque style house in a smaller form. I was never able to get the article to load. Every other article did! I read Stephen King back in the eighties ,when I lived by myself with my cat . But only at night with all lights except a lamp off . It certainly taught me how a building settles at night , the groans , the popping , the creaking . But was I scared ! At times yes ! But I had my attack cat with me ,if he wasn’t worried nor was I lol . Loved that moggy . And these old homes are a treat for the eyes . And a big Thank You All …..
Posted last year, I don’t know if it actually sold because it was listed almost immediately after. Updated the post with the new agent info and photos. Comments above may be older, moved to front page. This would certainly make a cool project. Makes you wonder about the on/off market dance. 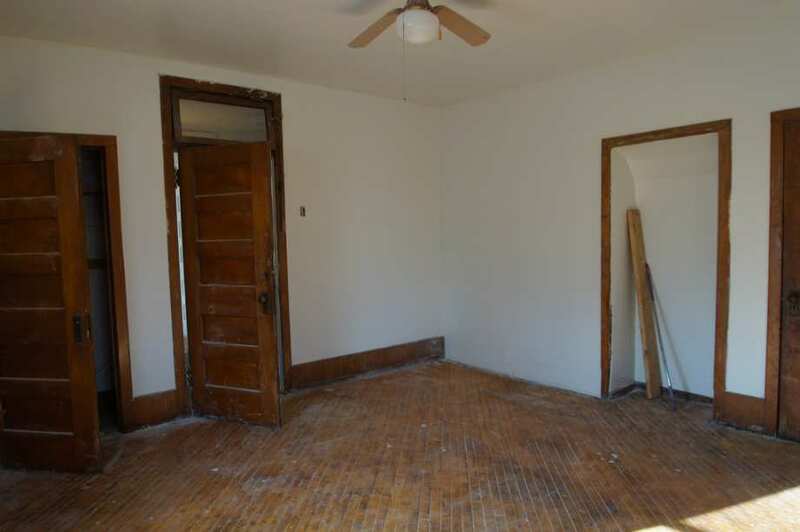 Oh my word, those diagonal hardwoods! I’m assuming those are the second story? 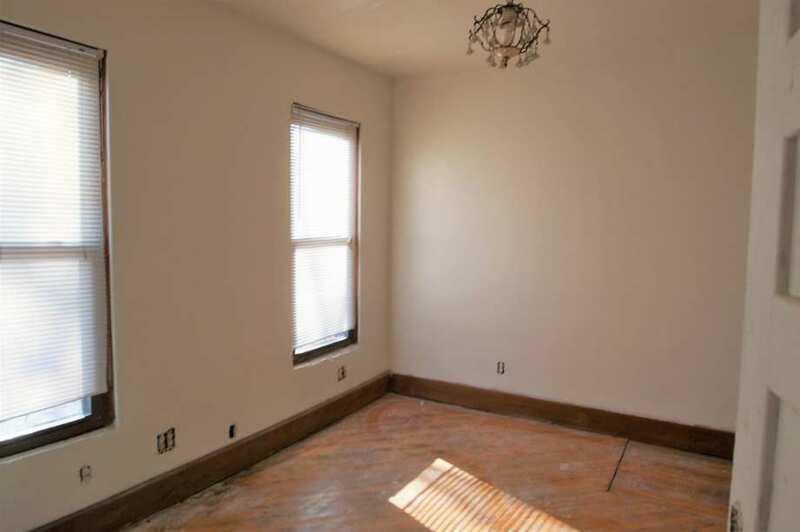 I was wondering about those diagonal hardwoods’ too! I don’t think I’ve ever seen that before! The gabled bungalow with a tower is a common planbook design. I would remove the back extension (with a wave of the magic wand); the house obviously started with a symmetric gable. 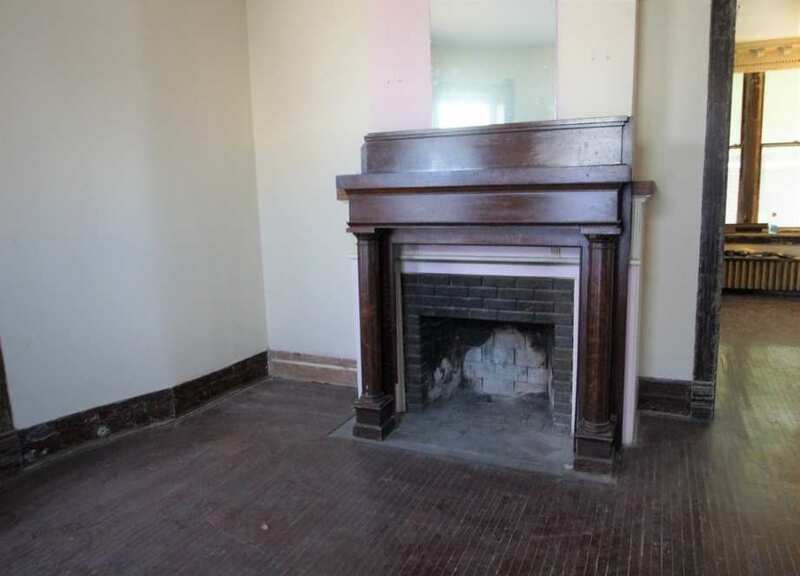 WHY people put in brick fireplaces back then I don’t know. Being modern, I suppose. “Restoring it to its glory” is a bit exaggerated. Still, a very nice middle-class house of the period, in limestone instead of brick. 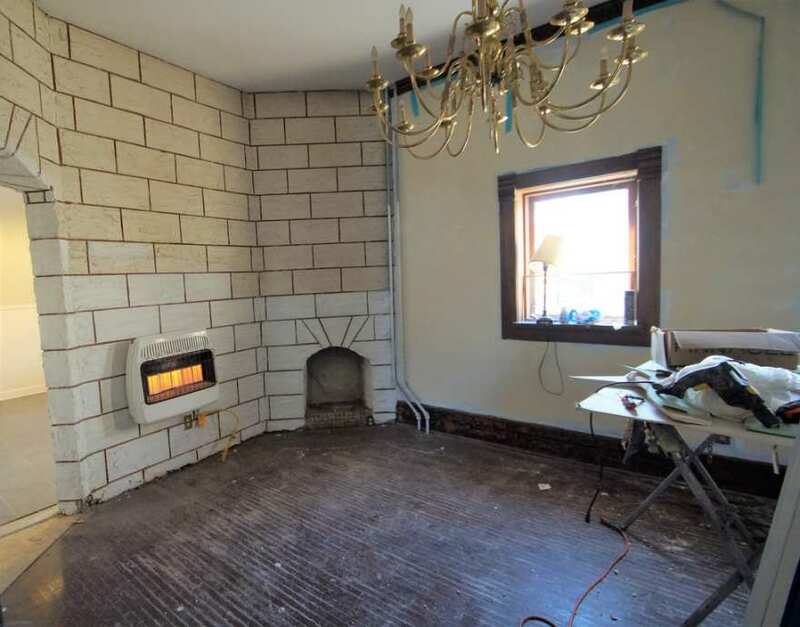 I think the brick face was added to an existing fireplace. Look inside the fireplace and there is what almost looks like tile. The room with the heavy cornice may have been the Dining Room. Yes, that was the one that caught my critical eye. 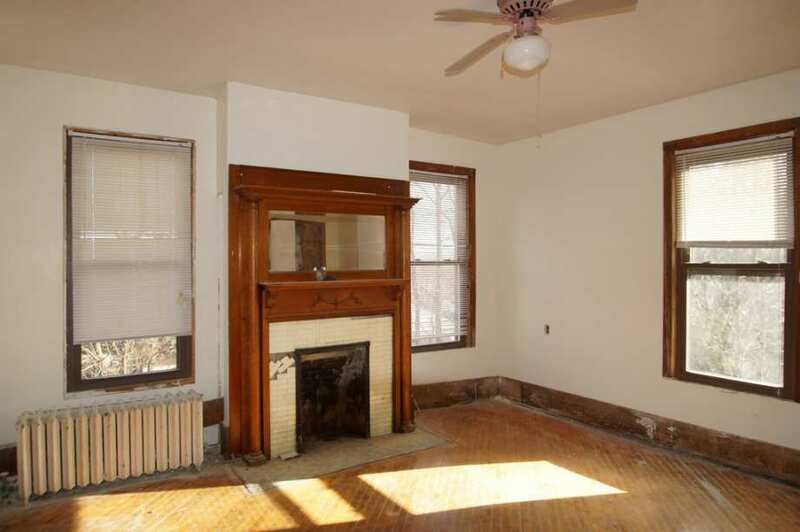 A Victorian brick fireplace would be much more complicated. 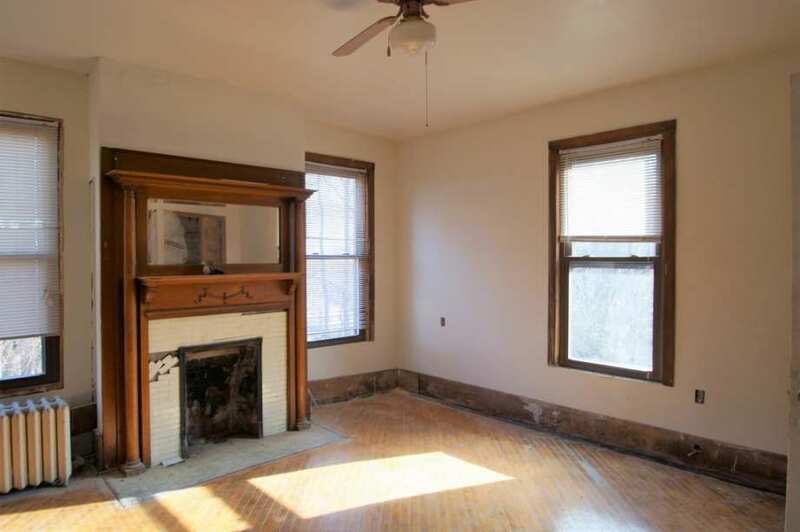 You’ll notice that in the previous photo they have a white mantelpiece with a dark-stained columned one standing in front of it. I suspect somebody went to a antiques sale and got the two dark ones. If you don’t want to take a sledgehammer to the brick, you can build a wood sheathing over it, with applied battens to make it look structural. Oh I understand you now Ed. When you said why did people put brick fire places back then, I thought you meant 19th century. I did extensive research on the neighborhood and it was always a working class neighborhood. Coincidentally my husband has the same occupation as the first occupants. This is Joliet or streator? 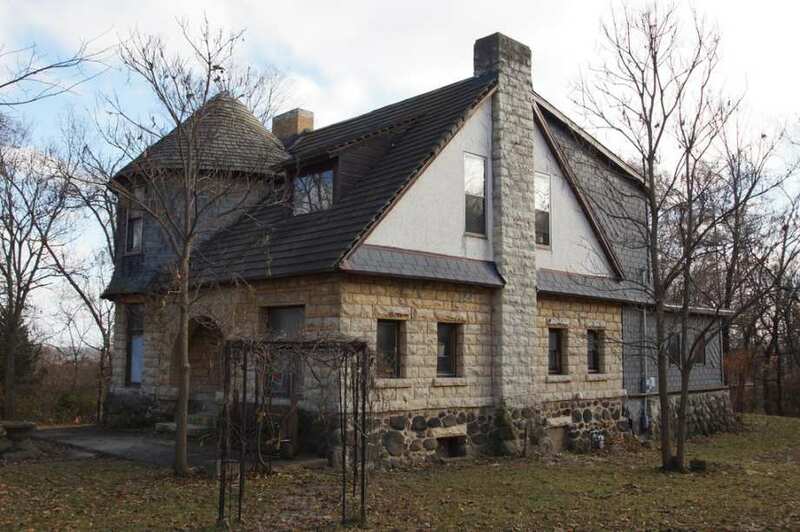 Interesting to think that the stone for this house probably didn’t come from very far away, and even has its own name: Joliet Lemont Limestone. It’s what the nearby (now-closed) penitentiary is made from. Realtor says buyer is responsible for permits and code violations. I wonder if this means the current or previous owner was in violation of codes? 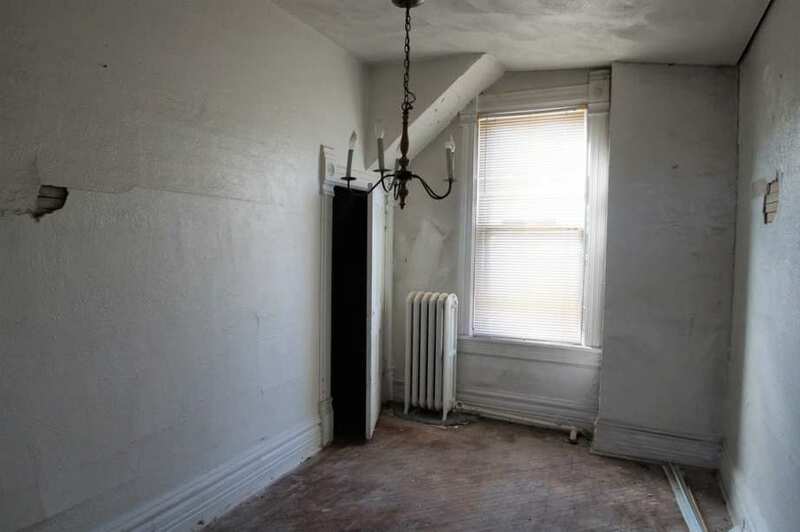 If that’s what the seller is saying and I had an interest in the house, I’d check with city hall before ever putting a penny down on this house. Code violations are a night mare to deal with sometimes. Then there is fines and liens the city can levy against the property. I have seen situations where the person doing the remodeling had to remove installed materials, pay a fine and apply for a permit. This may be a “BUYER BEWARE PROJECT”! I’m confused. 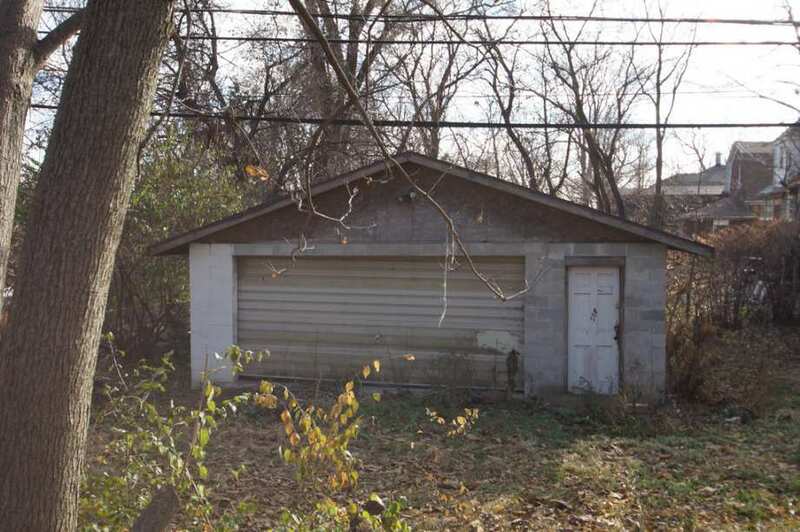 Listing says buyer responsible for code violations. Does that mean the previous owner caused code violations that the buyer will be responsible for? 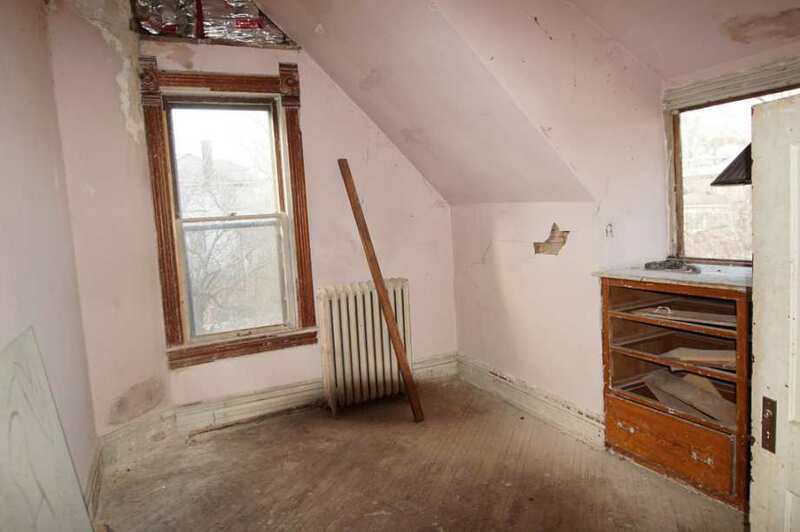 I assume the buyer will need to comply with current code during the rehab, but previous violations? Seems very odd unless I have mis-read. Anyone have a clue? The government will get what is owed to them. That is like the homes in Detroit, where new owners are charged the outstanding water bills from previous owners, I imagine. If the previous owner has done any remodeling, all of that work has to meet code but just on the part he remodeled. If he hasn’t followed the code on his work or did it without obtaining the proper permits, it is in violation of the code! It will have to be addressed prior to getting an occupancy permit. All parts of the existing house that has not been altered does not have to meet the current code! Still a good idea to check with the building department and find out what they want done to bring it up to code! They are usually reasonable to work with. Such amazing potential! 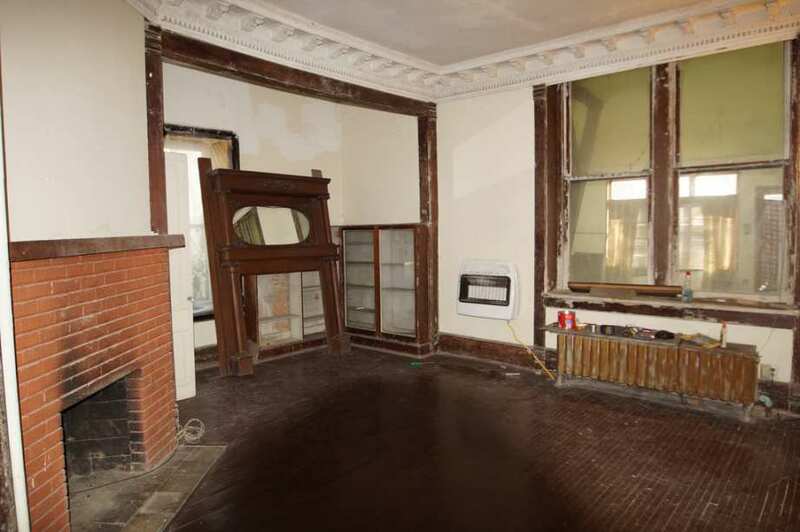 Regarding previous violation fees, if somebody knows somebody in city hall, maybe they’d be willing to work with a buyer who is undertaking a serious restoration. You never know. The round room with the chandelier is the future showpiece. I don’t know how old the street view photo is, or if it still looks like that, but I have to echo Bethany’s comment from above. That street view of the house is pretty cool. The street view is from 2012. I wonder what it looks like now! I wish street views were updated more often. 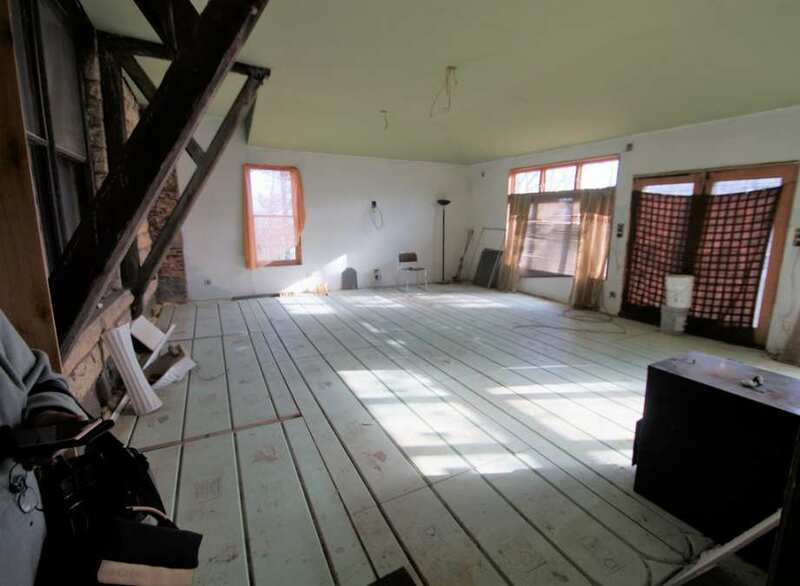 I was wondering if those diagonal planks were the subfloor and if the finished floor is missing. We had diagonal hardwood subfloor in a 1930 house in Minnesota with an oak finished floor running the expected way. That’s my guess. My 1887 Victorian had subfloor diagonal. You can see in the basement. That’s how I knew in the 1930 house, too.